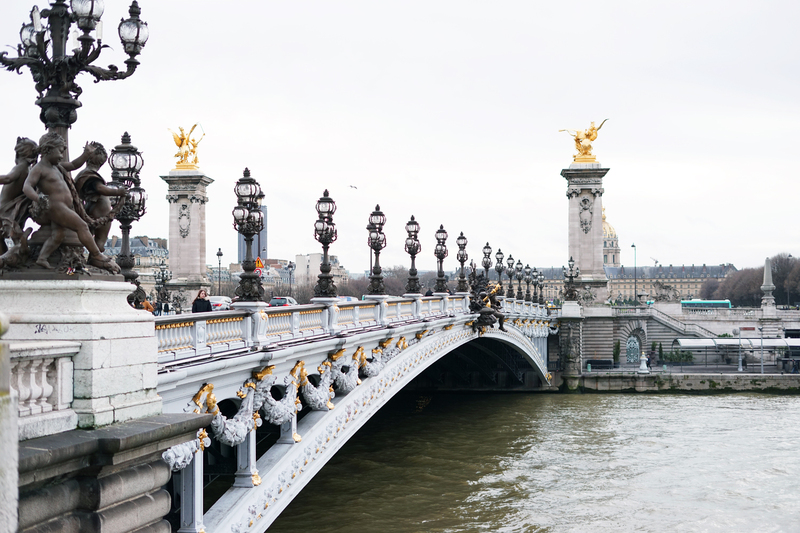 Pont Alexandre III has got to be the prettiest bridge in Paris. Believe it or not, even though I have been to Paris four times, this was my first time walking on this structure. The bridge connects the Champs-Élysées quarter with those of the Invalides and Eiffel Tower. From the bridge, you can see the dome of Les Invalides lit up golden at sunset with the Eiffel Tower as backdrop to the right. It is simply picturesque! The Beaux-Arts style bridge is quite ornate with its Art Nouveau lamps, cherubs, nymphs and winged horses and on a perfectly overcast day, that powder blue looks especially dreamy against the soft gray sky. 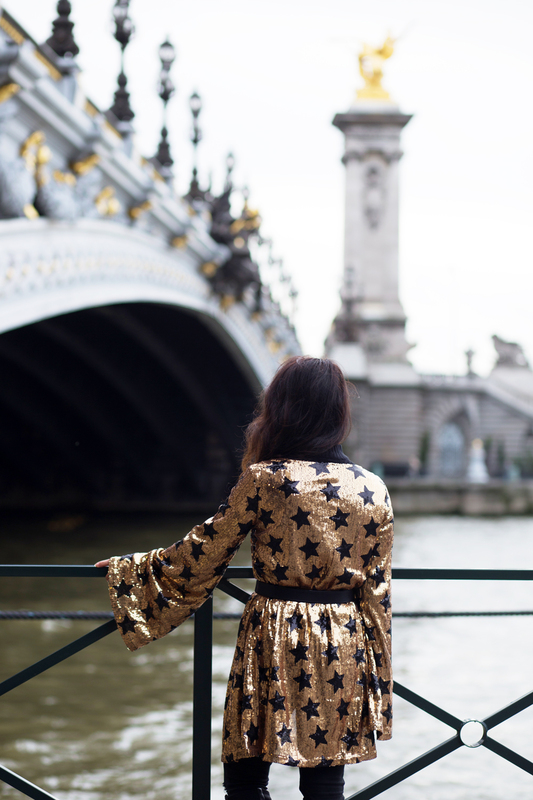 And in case you are wondering, I did purposefully plan to wear this over-the-top sequined cape-like jacket to match the gold details of the bridge. This is why packing for a trip always takes forever because I am literally planning outfits for specific locations! But hey, it's worth it right? 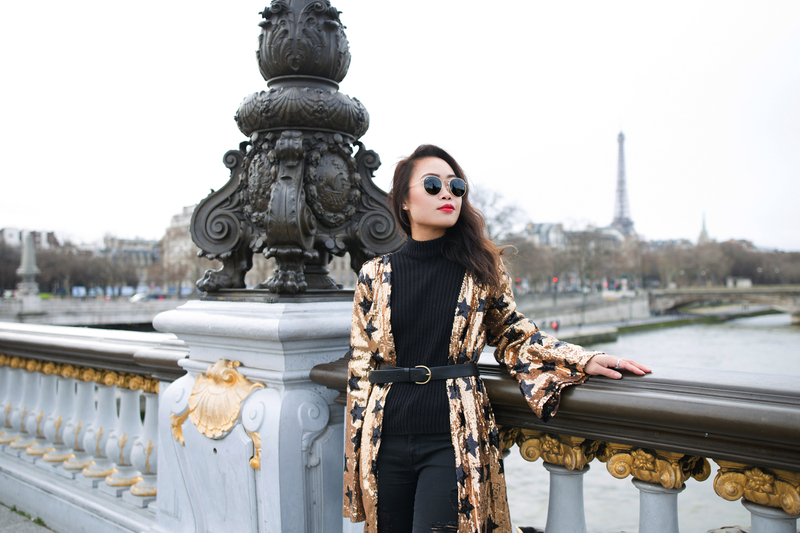 Sequined star print jacket from Boohoo. Mod neck sweater from H&M. Ripped denim jeggings c/o PacSun. Leather knee-high boots c/o Coach. Photos shot by Linh of Through The Glass Paris, edited by me.